Want to know the Best SIM card in India? If you are traveling to India and wondering which SIM card to buy in India. Then you are in the right place. 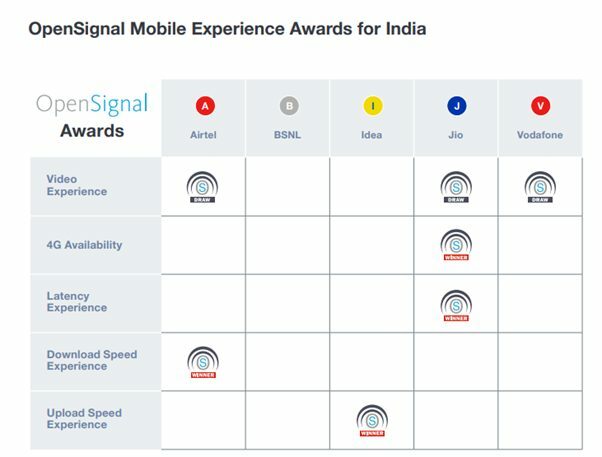 Here I have compared all the major telecom network in India which will help you select best SIM card. But before that quickly check if your phone will work in India or not. Will Your Phone Work in India? Before buying a SIM card, it will be important to see if your mobile phone will work in India. This means that for your phone to work in India, it must be compatible with these frequencies on a GSM network. Europe (click for band detail) and Asia Pacific countries runs on similar band like India but GSM carriers in America and Canada operate on 800/850 MHz and 1900 MHz frequencies. All of these operators have a 4G network and decent browsing and downloading speed. The first four are private companies whereas Bharat Sanchar Nigam Limited (BSNL) is a government-owned company. Airport: You will be provided with a pre-paid SIM card which means that you will pay in advance for the package you want. This would be the easiest way to get a SIM card. Find the telecom operators near the exit gate of the airport. Provide them with a copy of your passport, visa, and a photograph and the card will be activated in 10 minutes or sometimes an hour. It will cost around 400 INR for a month package. Local Shops: You can also buy the SIM card for a little cheaper price (300 INR per month) from the local shop. You may require a local referee (an Indian person phone number and address). The operator will call him/her and then your card will be activated. The prices are around 400 INR and it includes unlimited talk-time, internet, and SMS for a month. 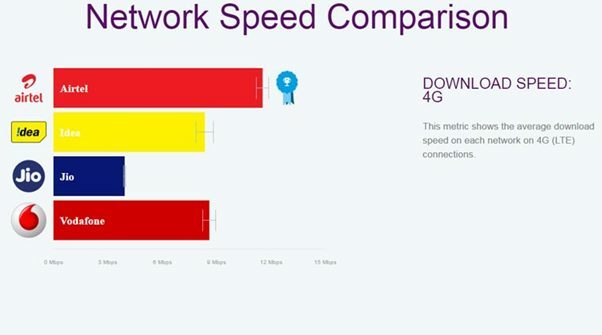 Some service providers has an unlimited internet (high speed capped at 1 GB/day and then unlimited low speed) whereas others have a limit of 1-1.5 GB/day which will be more than enough. If you run out of credit on your phone, you might continue to receive incoming calls, but will not be able to make calls or send messages. You can recharge the SIM from a local shop or go to the mobile company page or using apps like Paytm, Freecharge, Google Pay, Flipkart etc. Airtel, Vodafone and JIO have decent networks all over the country. BSNL is often lagging behind on this race and is known for poor network but in many remote places like Spiti Valley, only bsnl connection works. So if you are planning to visit a remote location then do some research and find out which network will best suit you. Some of these statistics will help you choose your perfect SIM card. 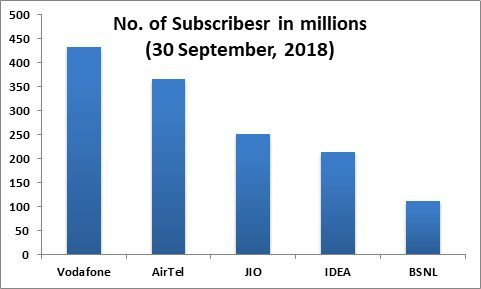 Vodafone is topping the list with a total number of 433 million subscribers with tough competition from Airtel. If you run out of internet and need some information (ATM location, currency exchange shop, bus stop) then call just dial (8888888888) and they can help you with the information via a text. They are mediator to connect customers to companies and its free.